Visit the Oklahamoa State University website to checkout pictures and history on breeds of cattle, horses, pigs, and more. Any and every question you have about horses or horse management may be found here. This site is a collaboration of extension services from universities all over the United States, provided to answer the most frequently asked questions about horses. TRY IT! Got lots of questions about how to get rid of worms? 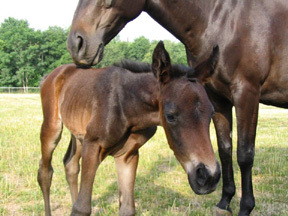 This link to the HorseQuest site covers both dewormers and environmental methods of reducing the worm burden your horse faces each year. This links to the official AQHA website.